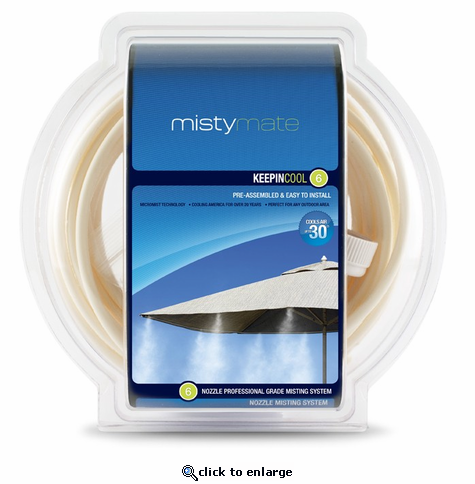 Misty Mate's "Keepin' Cool 6" home misting system is fun and easy to use! The Keepin Cool 6 personal outdoor misting system goes wherever you go! Keepin Cool system comes pre-assembled and securely clips temporarily to patios, tents, canopies, play areas...anywhere you need a cool mist. Provides you with 10 feet of misting to cool the temperature up to 30 degrees! 1) Resistant to Damage: These misting nozzles never rust and are more resistant to calcium deposits, which lead to clogging. 2) Superior Performance: MistyMate nozzles produce an ultra-fine mist that is noticeably superior to other systems. 3) Exclusive Design: Exclusively designed for use with MistyMate consumer products. MistyMate\xAC is the world\xCDs leading manufacturer of consumer mist products. Founded in 1989 with the invention of the world\xCDs first pressure operated personal mister, MistyMate\xAC personal misters emerged as the leading brand in the newly founded industry and still retains that title more than 20 years later. Today, MistyMate\xAC personal misters has expanded its scope to encompass a varietal product line while remaining faithful to its commitment to produce unparalleled never-before-seen consumer mist products. I just love this!! It really makes a difference when the weather is hot hot hot.